Mount Cook Airline is an “icon” in the New Zealand aviation industry, just as the mountain from which it takes its name is an icon of the New Zealand tourism industry. 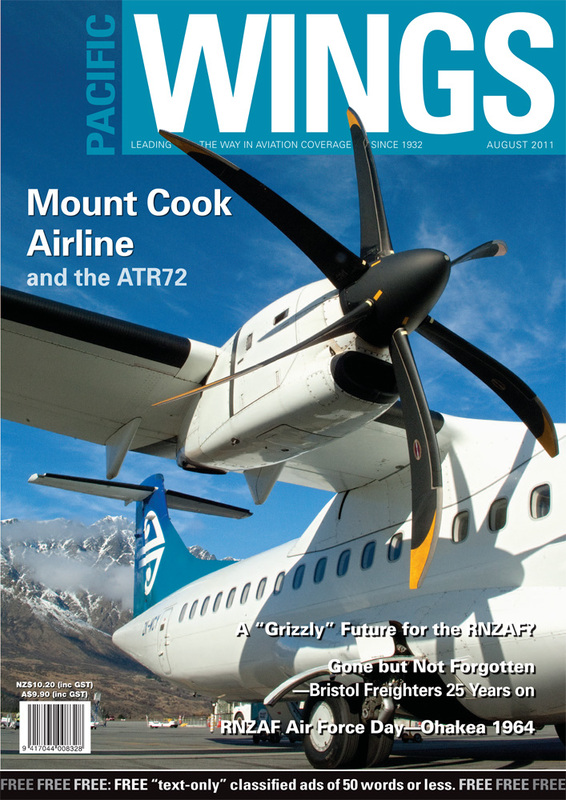 Serving both Mount Cook Airline and the New Zealand Tourism industry admirably is an aircraft that is likely to become another icon—for “green” commercial aviation—the ATR72. Rob Neil reports. A “Grizzly” Future for the RNZAF? With budgets ever tightening and governments seeking new ways to make their money stretch further, Rob Neil hypothesises about how the New Zealand government might potentially decrease its defence spending while simultaneously increasing the RNZAF’s air transport capabilities. The Breitling Jet Team is a star attraction at numerous air-shows around Europe every year. Ben Griffiths outlines the team’s story, which is illustrated by some wonderful images from New Zealand photographer, Mike Jorgensen. Frank Hitchens recalls the glory days of the memorably ugly but remarkably effective Bristol Freighter, which served New Zealand faithfully in both military and civilian roles for more than quarter of a century, and last flew in New Zealand a quarter of a century ago. As another article in this issue discusses the possibilities for a different future for the RNZAF, Murray Kirkus looks back at the glory days of the RNZAF in the 1960s and a spectacular pageant at Ohakea in 1964. Mark Wardle of the NZALPA discloses the recipient of the 2011 Captain Greg Vujcich Memorial Award for Excellence in General Aviation Instruction.